From the directors of the critically acclaimed and influential horror hit SPRING (2014) comes a mind-bending sci-fi horror about two brothers who get caught up in a 'crazy UFO death cult´. THE ENDLESS features what are fast becoming the directing duo´s trademarks - long, dread-drenched takes with detailed, naturalistic performances; superb, unsettling sound design; and an unpredictable, deliciously fresh script with Lovecraftian overtones. From the brilliantly staged rope-pull set piece, through to a seriously strange cult-style karaoke session, this is a stunningly realised slow burner that firmly establishes Moorhead & Benson´s unique cinematic universe, gripping you from the first shot, and steadily tightening its hold as things get very weird indeed. 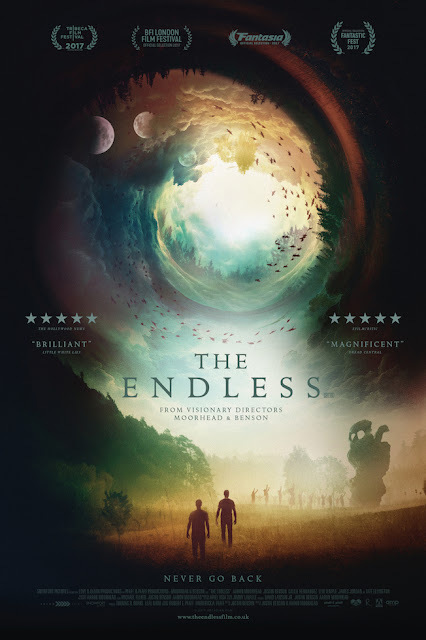 Described as a 'true indie gem´ by Bloody Disgusting, THE ENDLESS, is a genuinely extraordinary and groundbreaking cross between Of Mice and Men and Close Encounters of the Third Kind. After wowing genre fans at the 2017 London Film Festival, THE ENDLESS is now ready for more converts. Are you ready to join the cult following? THE ENDLESS is released by Arrow Films in Cinemas, and via Arrow Video on Digital HD on 29th June. THE ENDLESS will also be released on DVD & Blu-ray via Arrow Video on 2nd July.